This drawing is another ink sketch in the series (here) commenced in the new year. These are all prelimnary exploratory sketches for an intended series of oil paintings about/around Brett Whiteley. Brett Whiteley started to paint the Sydney Opera House in 1971 while it was still being built. He had just returned from New York and was now living at Lavender Bay from where the Opera House was clearly visible. The painting was first exhibited in 1972, but in 1982, after some additional touches, BW gave it to Qantas (the Oz airline) in exchange for free air travel. They decorated their club lounge at Sydney airport with it for almost 20 years before selling it off at auction. While some see this image as a menacing mass of shark fins, i see it as an exuberant, optimistic, flamboyant, crazy work of celebration. It makes one as happy as seeing the Opera House sparkle on a sunny Sydney day. 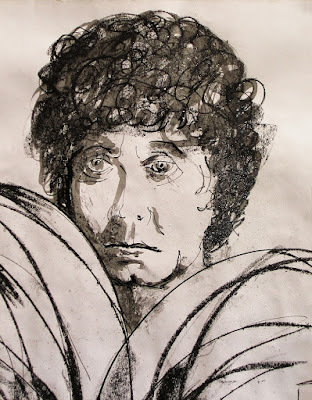 Yet in so many of the photos of Brett Whiteley he looks serious, troubled, depressed, while his writings are peppered with commentaries on existential despair. So i wanted to bring the two together to celebrate that mysterious relationship which exists between an artist and his or her work. In our understanding, the two often inform each other. Yet ultimately, the art can't be explained away by knowing the man, nor the man analysed away by knowing his art (Freud's musings on Leonardo border on being silly). Knowing BW had a heroin addiction or a psychotic episode helps get an angle on a few of his works but it hardly explains his talent as an artist. I can see why you are attracted to Whitley's work. I was not familiar with him so I looked him up on Wikipedia and watched the video and looked at as many of his works that were available online. He seemed to have had the ability to put down the essence of something or someone without any extraneous mark or stroke. No accident is saved unnecessarily. Nothing is redundant. That takes great discipline. I think he has exercised his negative capability! The video, as I interpret it, shows a man who appears manic. He talks so fast that I have difficulty following what he has to say. Some of it seemed to border on the nonsensical. It is in contradiction with the discipline that shows in his exuberant work. that I can't see because of the limitations of the internet to portray such things. Yet his work is so powerful in its spareness that emulating his discipline is well worth a series. You've made such a good start. Run with it. It will be interesting to see where it will go. One of the major things that makes me interested in Whiteley is his interest in negative capability, except he used terms like 'IT'. For instance, he once said ,"Only by annihilating every semblance and iota of deliberateness, by being desireless and not wanting anything. Suddenly, when drawing, one glimpses the Real Order, trhe absolutely inexpressible Flash." So it was essence he was after through what Taoism calls wu-wei. I know what you mean about manic. Was this just his enthusiasm and energy for life? Was he on something? Was he bipolar? Sometimes he goes on and on and i wish he would just give it a rest. I'm not sure i like this opinionated side of his character. But then, he had a lot of opposition from art critics so i guess he had his polemic well rehearsed. I'm not sure that he was disciplined. I think he was immensely ambitious and worked very hard for success. I am interested in his conflicted inner life, his vulnerablity that masqueraded as certainty, his intuitive way of working in a world that wants answers. It's in this mix that i see his depression. I don't intend to emulate his style. He was a master of line, and line is not my bag. Rather, i want the idea of 'Brett the Australian spirtitual artist' to be a source of inspiration for me in my own art making, such as it is. Thanks again, Davida, for the time and effort you put into writing such a thought through and thought provoking comment. It's a great stimulus to help me sort my ideas.